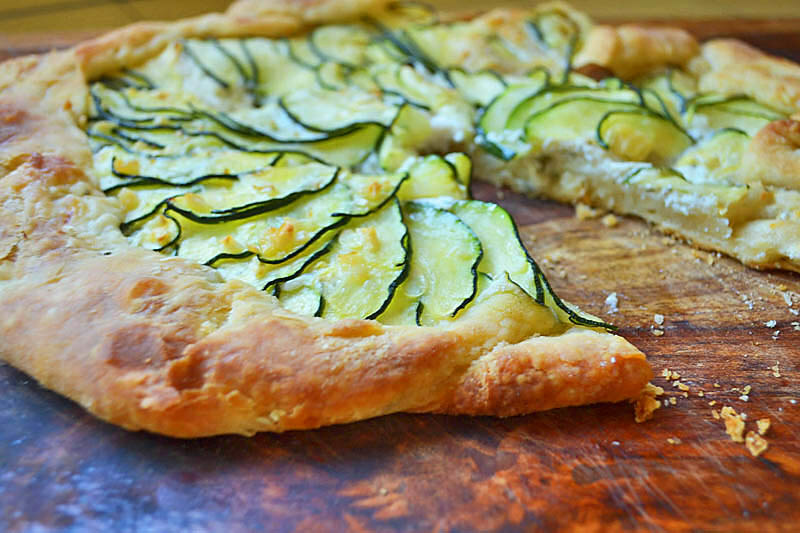 A summery take on a simple and rustic zucchini tart. Zucchini galette is perfect to use up the abundance of summer produce and has a flaky, buttery crust. 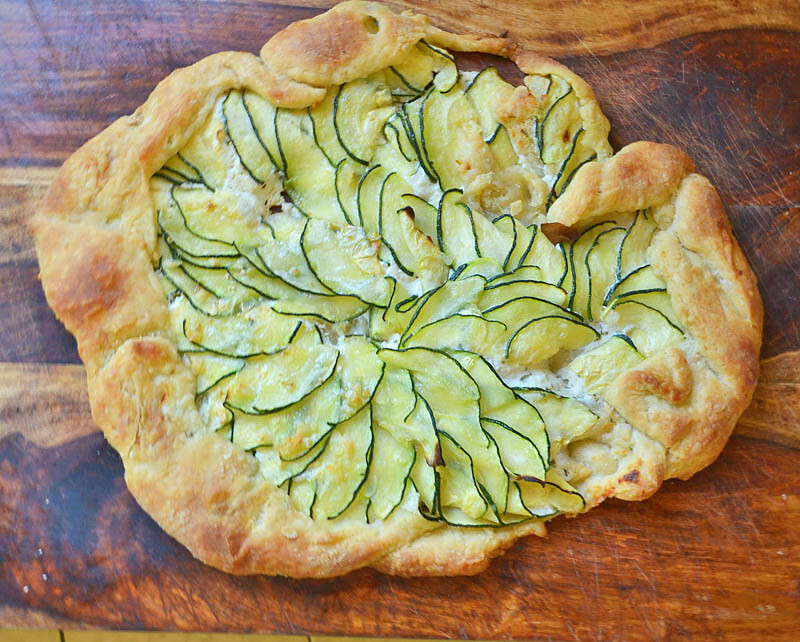 This zucchini galette was a piece of work. I was so excited when our amazing neighbors gifted us with a HUGE…and I mean humongous 4lb zucchini, I couldn’t wait to cut into it and make as many zucchini recipes as I could. I have seen lots of zucchini tarts and galettes floating around the web and adding the introduction of cheese and garlic would only make it better. So there I go on my researching quest and settle one from one of my favorite blogs. I was looking for something where the zucchini was thin enough and didn’t stay too raw and the crust was delicate and flavorful. I went onto working with the dough, which is not my forte to begin with, but seemed easy enough. 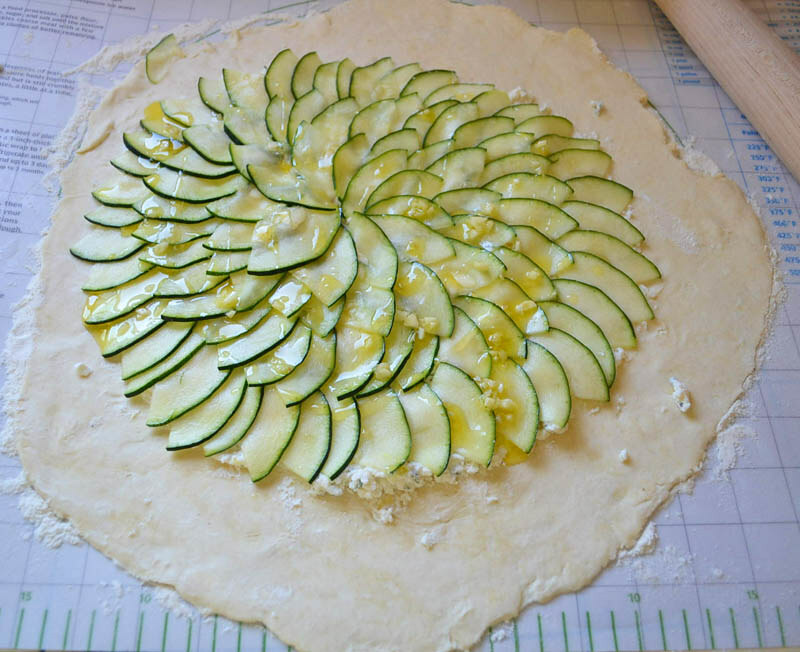 Continued onto gracefully laying each zucchini slice in a perfect circular pattern. Everything looked perfect, it was beautiful. Until…..I needed to transfer it to a cookie sheet. I failed to read the fine print in the original recipe: Transfer dough BEFORE adding other ingredients. Perfect. So here I am, with this gorgeously laid out galette and it is too heavy to transfer to the baking sheet. Instead the dough decides not to budge and stay as stubborn as it wants. So I do what any other normal personal would do. I started crying. Then I laughed and got on the floor with my baking sheet, flour jar and galette stuck to its sheet thinking that’s going to make a difference. Then finally…..I did it. I pulled it off like a band aid. And this is what I got. Of course this is not the END of the world, but at this very second it was. So what the heck…I threw the zucchini galette back in the oven anyway and figured it better taste good after all this work I put into it. After 30 minutes of cook time and mental anguish, I pull out the masterpiece that this once was supposed to be. And long and behold…. A beautiful and incredibly rustically tasty zucchini galette magically emerged from my oven. I danced with glee and jumped up and down. It doesn’t look that bad, does it? And it tasted amazzing! So what is moral of the story? Well…I need to get a grip on myself obviously, but more importantly, even if it doesn’t look pretty make the best of it anyway. 1) First make the dough. Sift together flour and salt in bowl. Add small cubes of butter and blend together in food processor until it looks like small peas. 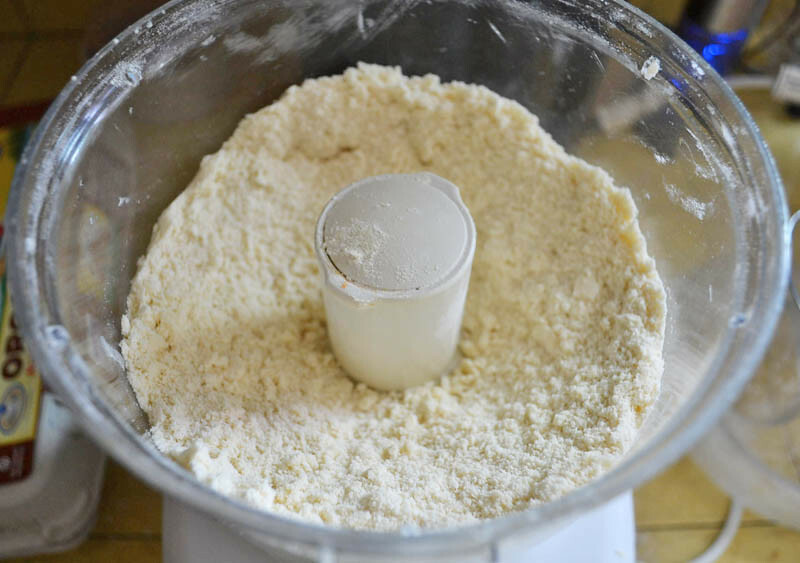 2) In another small bowl, whisk together sour cream, lemon juice and water and add this to flour mixture. Using a spatula or your hands, mix together until everything forms into a ball. 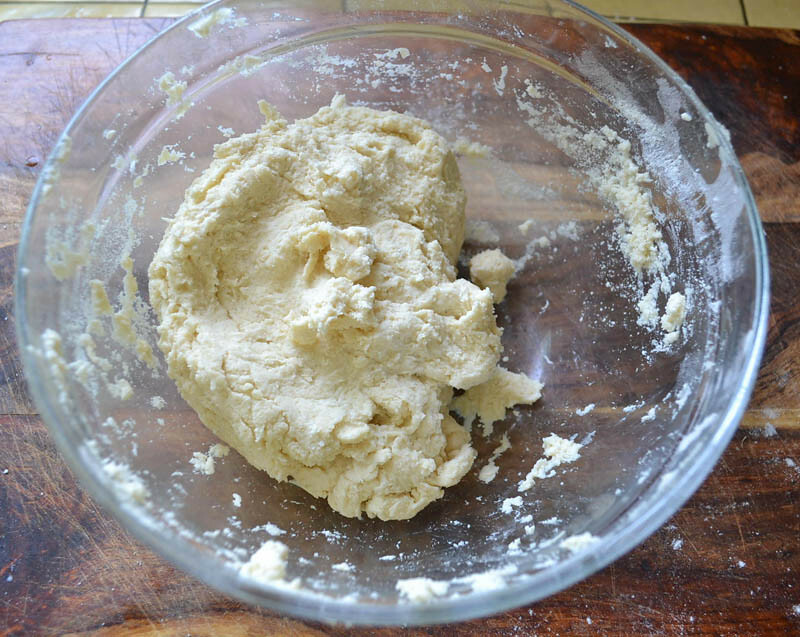 Don’t overwork dough.Wrap in plastic wrap and refrigerate for at least 30 minutes. 3) Next prepare the filling. Cut zucchini into thin slices. I used my slicing attachment on my food processor and prefer thinner slices. Lay all the slices on a single layer on paper towels and sprinkle with salt. Allow to sit while you prepare other filling. Blot with paper towel to remove excess moisture. 4) In a small bowl, whisk together olive oil and garlic and set aside. In another bowl, mix together ricotta, Parmesan cheese, thyme, salt and pepper and 1tsp of olive oil mixture. Set aside. 5) Pre-heat oven to 400 degrees. On a floured surface (VERY floured) roll dough out to about 12 inches round. Now THIS is the step where I failed. Transfer dough to baking sheet with lined parchment. Spread ricotta filling evenly leaving a border. 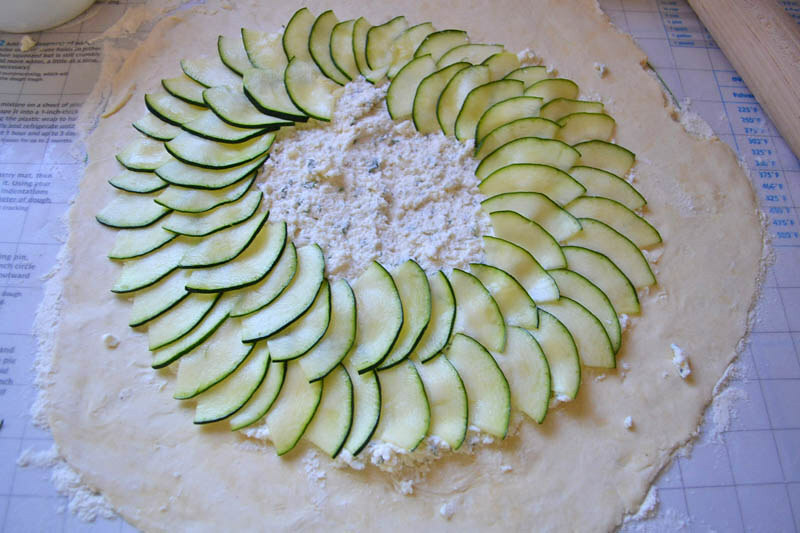 6) Lay zucchini on top of ricotta mixture in a circular pattern, starting outside. Drizzle remaining olive oil on top. Fold the border over and pleating so everything is tucked. 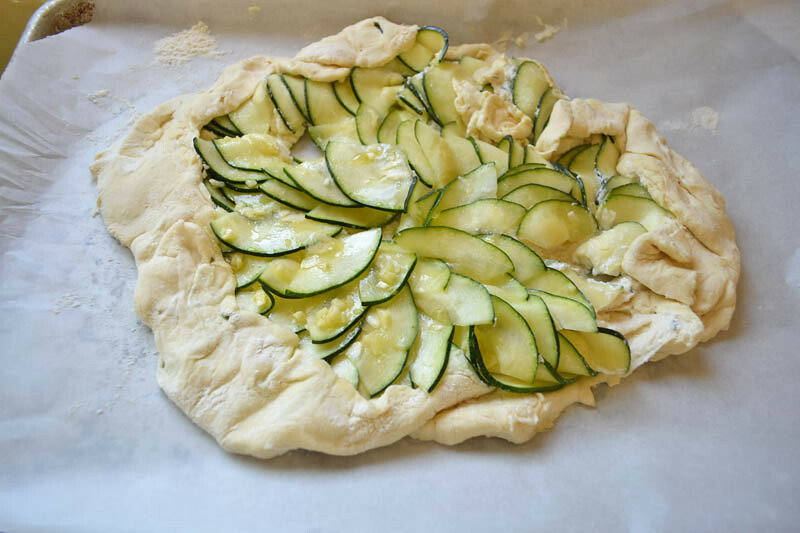 7) Bake the zucchini galette at 400 degrees Fahrenheit for about 30-35 minutes until crust is golden brown. First make the dough. Sift together flour and salt in bowl. Add small cubes of butter and blend together in food processor until it looks like small peas. In another small bowl, whisk together sour cream, lemon juice and water and add this to flour mixture. Using a spatula or your hands, mix together until everything forms into a ball. Don't overwork dough. Wrap in plastic wrap and refrigerate for at least 30 minutes. Next prepare the filling. Cut zucchini into thin slices. I used my slicing attachment on my food processor and prefer thinner slices. Lay all the slices on a single layer on paper towels and sprinkle with salt. Allow to sit while you prepare other filling. Blot with paper towel to remove excess moisture. In a small bowl, whisk together olive oil and garlic and set aside. 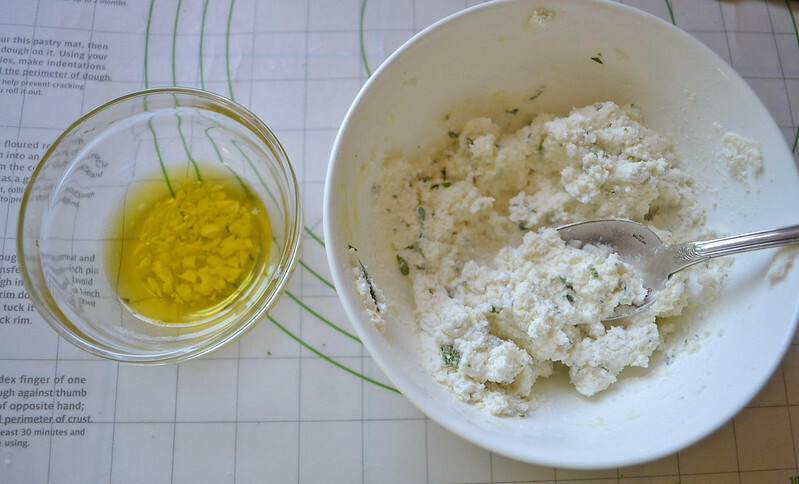 In another bowl, mix together ricotta, Parmesan cheese, thyme, salt and pepper and 1tsp of olive oil mixture. Set aside. Pre-heat oven to 400 degrees. On a floured surface (VERY floured) roll dough out to about 12 inches round. Transfer dough to baking sheet with lined parchment. Spread ricotta filling evenly leaving a border. 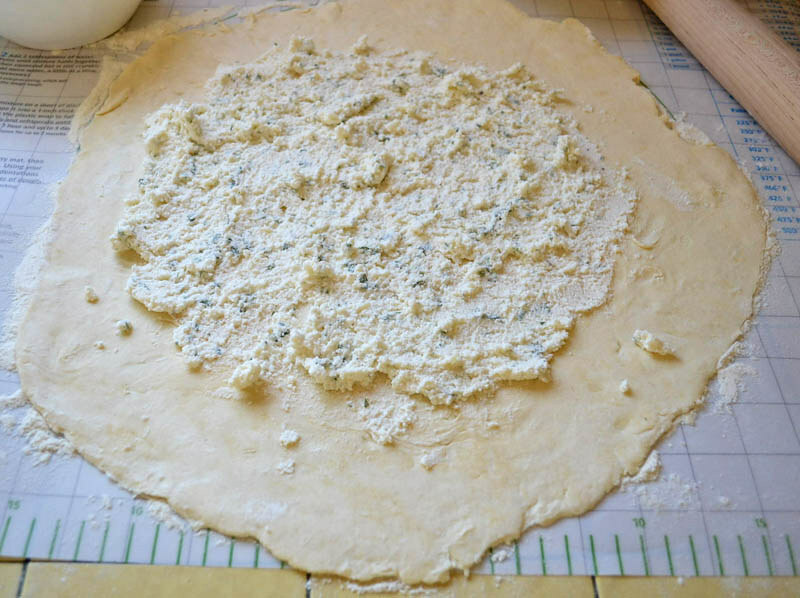 Lay zucchini on top of ricotta mixture in a circular pattern, starting outside. Drizzle remaining olive oil on top. Fold the border over and pleating so everything is tucked. Bake at 400 for about 30-35 minutes until crust is golden brown. This looks super delicious- and gorgeous! I need to start doing something cool with my zucchini! It is actually quite nice-looking – just call it rustic and all is good. What matters is how it tastes and it does look rather tasty! It’s beautiful!!! Zucchini and ricotta cheese, I’ll be making this for sure. Pinned it to I Heart Zucchini Group Board too. I think you were stressed out over nothing. It still looks beautiful and I bet it tasted great too. I love your truthful story about the little screw-up. We have ALL done something like that! 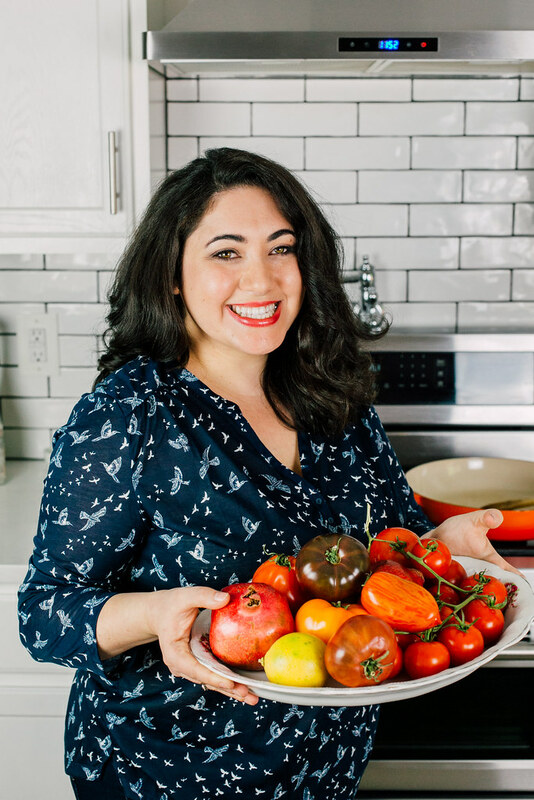 Bibi @ Bibi’s Culinary Journey recently posted..Happy Birthday, Julia! This is one of my favorite smitten kitchen recipes. If you haven’t tried the butternut squash and caramelized onion galette (the book version, is better than the web version) its even MORE amazing than the zucchini one! I made your sprouts tonight and they were great!